Henry Dearle, Morris' first weaving apprentice, became a talented designer in his own right and on William Morris' death in 1896 he took over Morris & Co. So close was he to Morris in style that many of his designs for wallpapers and fabrics have been mistaken for Morris' own. 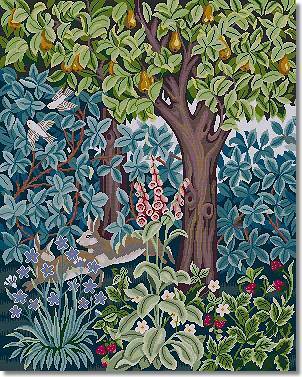 However, it was in tapestry that he revealed his greatest talent and here his work is quite distinctive. Greenery is one of his finest works. 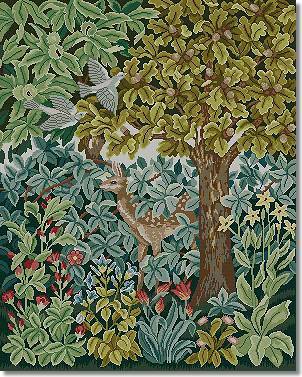 The original Greenery tapestry, completed in 1892, is now on loan to the National Trust of Scotland and is hung at Crathes Castle, Banchory. A second weaving was completed in 1915 and is in the Metropolitan Museum, New York. The design is available in a single panel or divided into three parts. 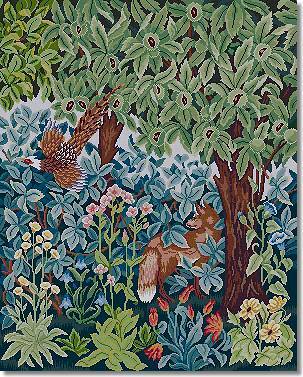 The kit uses Appletons crewel wool on 14hpi canvas and measures 63" x 26" (160 x 67cm). Overall canvas size 69" x 30" (175 x 76cm). The kit uses Appletons wool on 14hpi canvas and measures 26" x 21" (66 x 53cm).